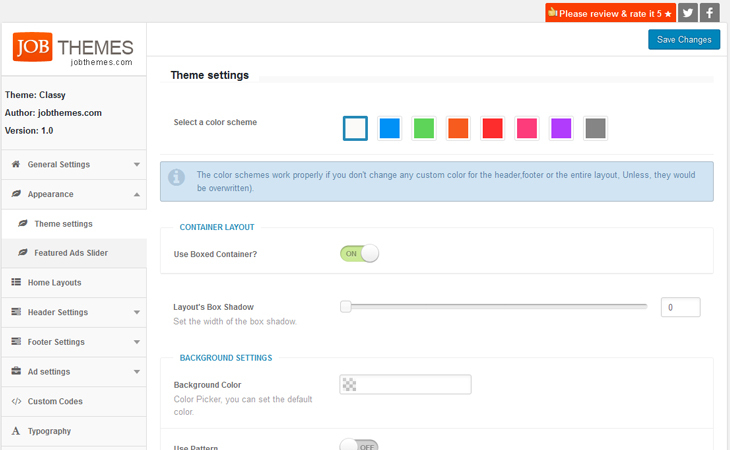 I added this child theme and I want to set it up with the categories listed below the slider. How can I do that? Right now, everything below the slider is just blank. Ok, now the ad listings are there but I want it to show the categories instead. Thank you. Ok, now the categories are there but there is blank space for images, represented by a circle. 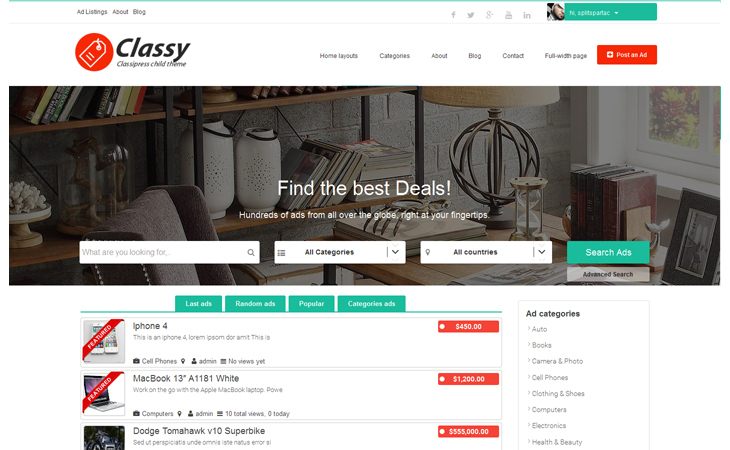 All I want is a simple text list of categories like on the classipress ‘Ad Categories’ page. Hi My featured ad slider does not work for some reason. It just lists the featured ads down in a column. Any thoughts? could you please share the url ? Or can i email you privately so that i dont fill your feed? Is it possible that I can screenshot you the problem instead? the ability to comment on an ad is somehow disabled or not showing. I also cannot see the comment either. Contrary to this, when I activate the original Classipress theme, it works. Any Ideas? Also my primary menu bar does not show the sub-categories correctly. Any Ideas? Beautiful theme. A few questions first and some may pertain to the classypress theme itself which I am not familiar with. First are the registration form and the submit your listing forms easily customized ? Also because I will be a small local listing in Florida can I eliminate the countries category in the search bar. Even possibly eliminate the search bar it self ? Thank you ahead of time and like I said love the theme. Yes, The regisration form can be customized but there is no options either on classipress framework or classy theme, but with few dev skills, the login/registration forms are on semarated files, and well commented and easy to handle. I Have seen many guys did that before and showed the procedure on the forums. -Yes it’s possible to eliminate the countries options on teh search bar.I can help You with that editing 2 lines in the code. does classy work fine with last classipress 3.6.0 version ? 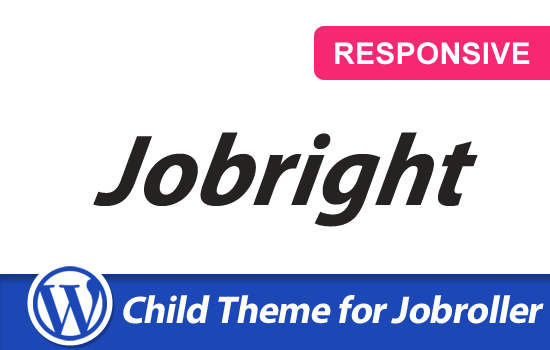 I just purchased this child theme, is there a documentation for this anywhere i can find? please advise. thank you. For now there is no docs file, I am preparing one, you receve it and all the other customers in 48 hours. meanwhile, I am here to provide support and answer all your questions about how to use it. 1. how to change the logo. 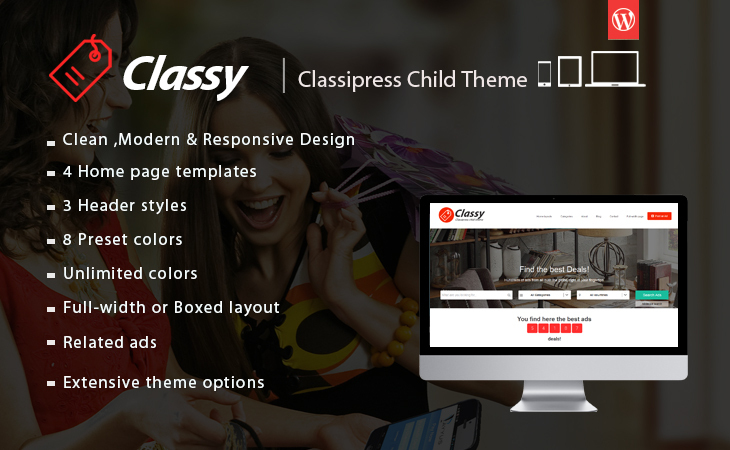 changing it via customize under theme appearances/header does not change the logo, it works for classipress but not for classy. 2. I would like to add the filter by country same as the one shown in the demo. 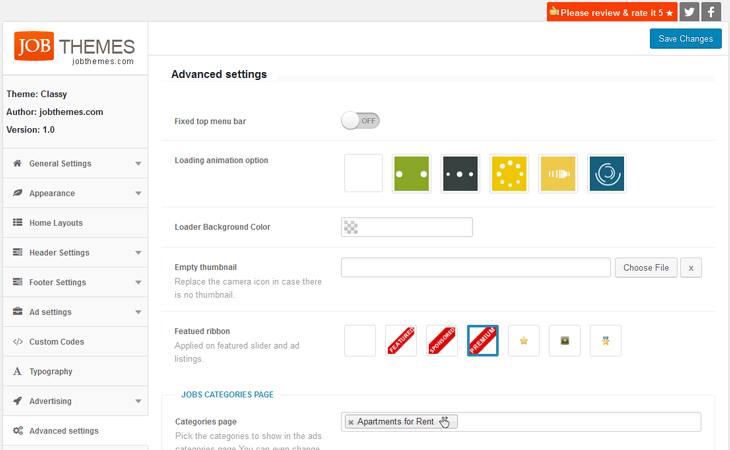 as well as addition of the advanced search button. 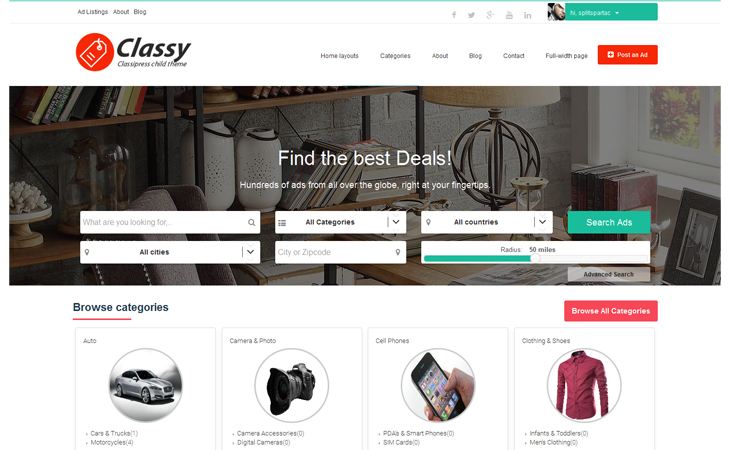 You have a full new theme options for classy theme, go to wp-admin , on the left menu, you see classy sub menu there, click on it, and upload the logo there and save it. -you find there search settings, you can set it the way you want. 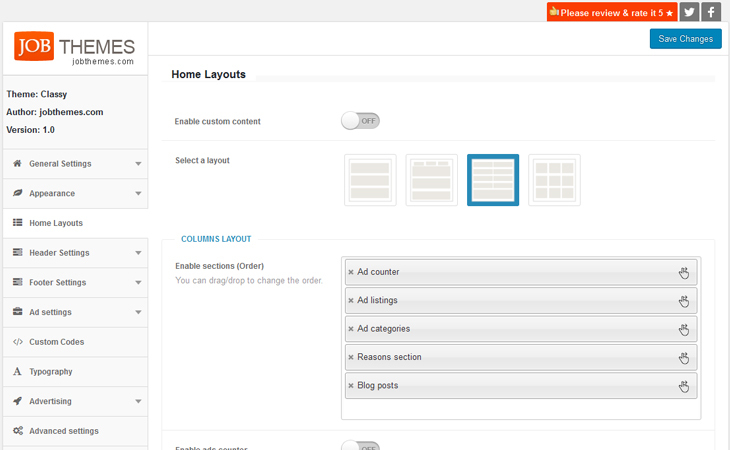 the theme option panel is user friendly. all figured out, thank you! How do I get in to view the admin demo? It’s not working for me. 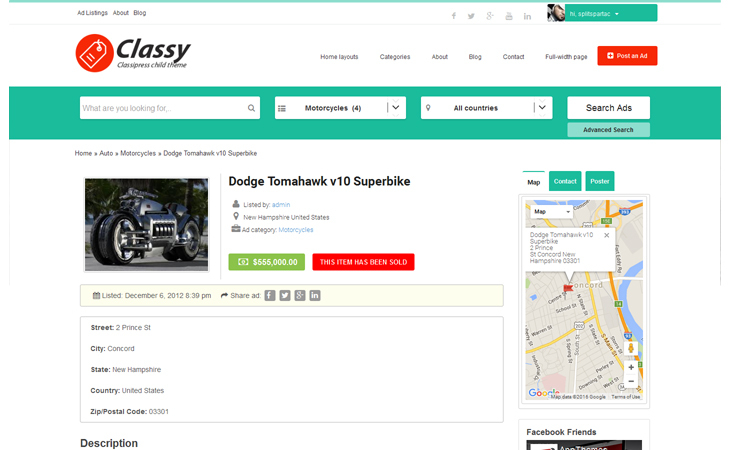 can you please enable featured listings? try to disable all the plugins then try again. admin access has been sent one week ago. Any news ? Hey, I just bought this, and not sure how do I get support. There are quite a few issues out of the box for this child theme. 3. 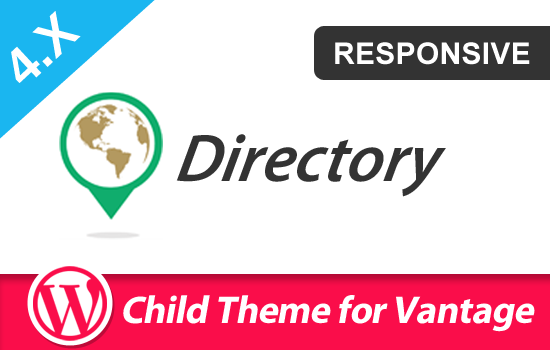 Google Map not showing when this child theme is activated. There is no issue with the default theme. It will be good if there is documentation. Thank you for purchaing our theme. Since you purchased the bundle package, You can leave comments on its page. -Please send url + admin access by email, I will look into it and fix all the issues you are having! I am going to send it by email immediately. the appthemes updater works that way, it only uploads the updated changed files. Thanks for purchaing our theme. please send the admin access so I disable it for you by editing a line of code, because there is no option for that, except if you change the country list into a cities’ list or areas. Send the admin access by email please, never post it here. did you receive my mail sent the 23 ? I’m « toilebleue » You answered my message on apptheme. Can you send me the code that needs to be changed because I do not know if my client will want to deliver the country eventually? I also have another big problem, I activated the Googles fonts everything works correctly on computer but on smartphone or tablet the fonts are well customized on the home page but not in the internal pages, there is also a problem with the menu that does not switch to « mobile” on tablet. Finaly I decided to use “country” like “regions” so I transform the field. Hello, I am sending you a message here because you do not answer the emails of support! > The abstract of the text of the ad in the list of the advertisement does not include the link of continuation […] this link exists on the original version of the theme and on all the other themes children. Please solve these bugs as soon as possible, if they are things that you can not or do not want to do thank you for refound me. But the problem is, I can’t center the “Ad Search”. Can you please share the url of the website? what version of Cp you are using? Is this compatible with version 4.1 ?